Garage doors are more than utilitarian additions to your home. The right garage door can make a statement about your home and the people who call it home. It can also add an incredible amount of curb appeal. Whether you’re looking to make your neighbors a little bit green with envy or you’re looking to make your home more attractive to buyers, choosing the perfect garage door can help you accomplish your goals while helping you fall a little more in love with the place you call home. How Much of a Difference Can Garage Doors Make for Curb Appeal? 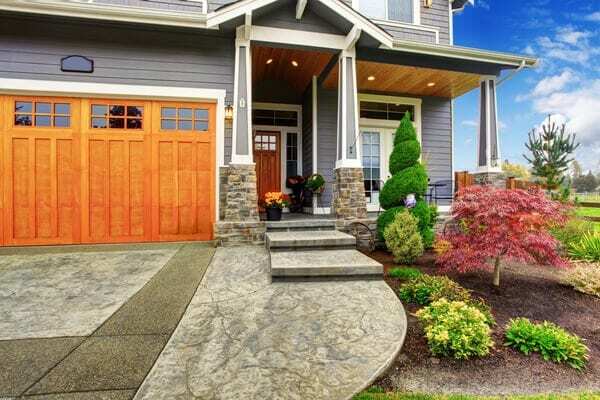 Curb appeal is all about making that important first impression. Whether you’re inviting your boss over for dinner or trying to make a splash with the other Girl Scout parents, your garage door can make a bold statement about you and your home. More importantly, garage doors can help transform a tired and worn exterior that feels dated and drab into something that is thoroughly modern, offers ageless charm, or provides the perfect contrast for a contemporary look that will undoubtedly turn heads. How’s that for curb appeal? Sometimes, changing the garage door is about restoring something that’s been lost in the home over the years. It can be an architectural addition as much as an aesthetic one. Although minor, the change can restore former glory to a rustic or charming home. In other instances, it can take an ordinary and somewhat plain garage door that blends in with the house and make it stand out to catch the eye and create interest. Without changing anything else on the home, adding a new garage door to your home’s exterior can be eye-catching. Combine them with other activities designed to boost curb appeal like landscaping or pressure washing your driveway and siding and marvel at the eye-popping results. It is truer today than ever before that your home’s doors matter. A decade or so ago, the front door was the most important door to your home. That is no longer the case. With many homes having two or more garage doors facing the street, the bigger curb appeal – and most dramatic visual appeal – is going to go to your garage door. That is why you must take your time and consider design when choosing your garage door rather than merely paying attention to the function of the door. Aside from paying attention to design when picking out new garage doors for your home, consider investing in a new garage door opener at the same time. This way both pieces will be under new warranties, you’ll be better able to remember the important dates of purchases, and you can feel confident there won’t be problems with the opener that may place your new door at risk of jamming or becoming damaged by the opener. Your new garage doors are an investment in the curb appeal of your home and your personal enjoyment of your home. Everyone wants a home that catches the eyes of passersby and makes them wonder why they didn’t think of that. Choosing visually stunning garage doors is a beautiful way to make a bold statement about your home and your family. Consider being a little more selective, though, and choosing insulated garage doors. Your garage door likely serves as a buffer zone between the outside and the interior of your home. You probably come in through the garage loaded down with packages and groceries throughout the year. When you close insulated garage doors, they provide a buffer between the harsh heat of summer and the bitter cold of winter – preventing it from coming into your home and raising your energy bills. That is when form meets function, and it can help your garage doors pay for themselves over the years. Invest in quality garage door springs. It is worth replacing the springs when you purchase a new garage door to help protect your investment. Work with a professional organization that understands the value of these springs and will help you choose the one that best meets your needs according to the style of garage doors you have, the type of opener you have, and the expected life of your doors and springs. Finally, don’t forget to consider professional installation for your shiny new garage doors. These doors are an investment in the beauty and value of your home. Don’t risk damaging your new garage doors by bringing the guys over to muddle through the installation process on the weekend. Invest in professional installation from the beginning and enjoy a far more pleasurable installation experience followed by long years of enjoying your new purchase. Contact us today and let us walk you through the process of selecting the ideal garage doors and openers for your home and needs. We’re here to work with you to help you get the dramatic curb appeal transformation you’re looking for.